SEATTLE — While many may know her as an iconic Victoria’s Secret Angel, Gisele Bündchen is also one of the most charitable celebrities in the world. From Zero Hunger to her line of sandals that support the protection of Amazon Rainforest water sources, Bündchen has proven again and again that being one of the most famous models of all time can also enable one to make an incredible humanitarian impact. Below is a list detailing Gisele Bündchen’s philanthropy and the five causes she has supported. Zero Hunger Program: In 2003, Brazilian president Luiz Inácio Lula da Silva launched the Zero Hunger Program. The goal of the program was to allow people to access enough food to meets basic nutritional needs. Gisele, a native Brazilian, donated her modeling fee of $150,000 from her time at the Sao Paulo Fashion Week to the program. Since the start of the program, Brazil has seen a decrease in malnutrition, with rates now below 2.5 percent of the population, compared to 4.6 percent around the time the program was started. The program’s strategies included the “Bolsa Familia” program that aimed to improved local economies while also helping lower income families, financial support to farmers and projects to improve communities, such as providing food for schools. 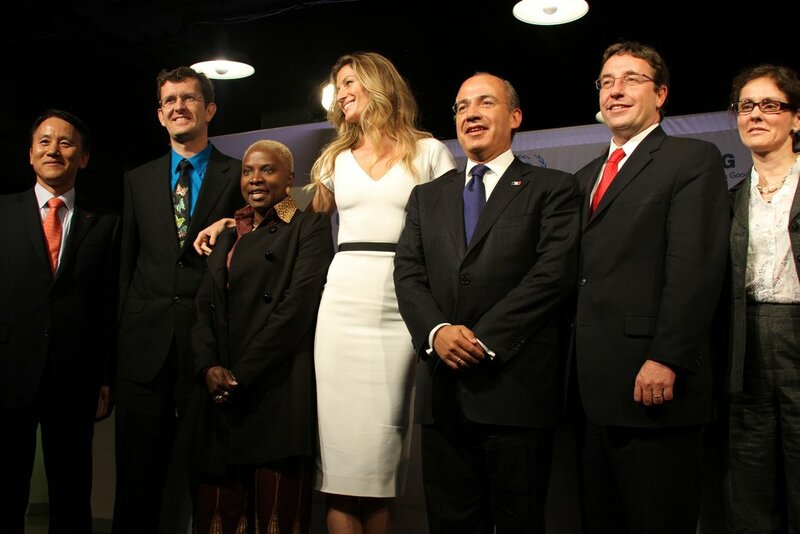 Africa’s HIV/AIDS: The American Express (RED) Card, which donated a percentage of from all financial transactions to Africa’s HIV/AIDS victims, was promoted by Gisele, who has been vocal about helping HIV/AIDS victims. The RED company also partners with other companies that work to end HIV/AIDS. All proceeds help fund HIV/AIDS programs. Gisele has also protested against the lack of attention that was being given to HIV/AIDS victims in Africa by painting her face for the “I Am African” campaign. HIV/AIDS continues to be a global health issue. In South Africa alone, 7.1 million people are living with HIV. Eradicating these diseases is crucial to improving the quality of life for people in developing countries. Ipanema Gisele Bündchen Sandals: Gisele partnered with the footwear company, Grendene, to create the line, Ipanema Gisele Bündchen. The line promotes environmental causes, specifically related to the Amazon River and Rainforest. While visiting a native tribe, Gisele saw the effects of the deforestation and became motivated to promote environmental causes. The Xingu River, which feeds into the Amazon Rainforest, has been suffering from deforestation in the area. The Xingu River is a major tributary of the Amazon River, so when the Xingu river is suffering, so is the Amazon River. This is a problem since the Amazon River is a mode of transportation and provides fresh water and food for tribes in the area. Projeto Água Limpa (Clean Water Project): In her hometown of Horizontina, Rio Grande do Sul, Brazil, Gisele launched the Projeto Agua Limpia with her father and family. This initiative aims at preserving the water quality in the Rio Grande do Sul through sustainable environmental management. Three of the top 10 most polluted rivers in Brazil are in The Rio Grande do Sul. By educating locals, the Clean Water Project gives power back to the people so that they too may take part in saving the forests and rivers, and thus, their sources of food and water. The Luz (Light) Foundation: In 2007, Gisele founded the Luz Foundation to “bring more light into the world.” The foundation’s goal is to empower young women through various programs. Empowering young girls is crucial in developing countries where a gender bias exists against them. Unequal access to economic resources is a factor towards women in poverty. In order to escape poverty, one needs to be able to access basic needs for themselves and their families. Empowering women, both physically and mentally, is one step towards reducing the number of women in poverty. From her Victoria’s Secret days to the numerous socio-environmental causes, Gisele has demonstrated that a high-profile platform can be leveraged to improve millions of lives. From helping her hometown in Brazil to empowering young girls around the world, Gisele Bundschen’s philanthropy demonstrates that this super-charitable supermodel has made tackling global issues her mission.